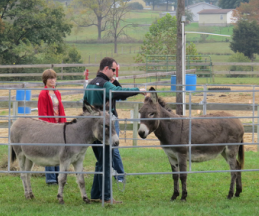 Our Mission: In partnership with horses, Breaking Free provides an alternative therapy that encourages and challenges people to overcome the effects of trauma, emotional hardships, and other barriers to quality of life. Breaking Free is located on the North Fork River in the Shenandoah Valley, Virginia. Improve family communication, gain confidence facing an important life transition, improve team-work within a non-profit organization, improve an office environment. Whether seeing better mental health as an individual or as a family, or better life working relationships with colleagues and co-workers, clients work with Breaking Free is ready to design a mental health experience with horses to meet the client's needs. For a referral form call Paul or Jenny Foltz at 540-896-8505 or email jfoltz.breakingfree@gmail.com. Hold Your Horses! is for at-risk or court ordered youth of any age. A team consisting of an equine specialist and a mental health specialist (and the horse!) works with each individual, adjusting the exercise and activities to accommodate the needs of that client. Hold Your Horses! focuses on cognitive-behavioral skills that are relevant when working with impulsive and aggressive youth. For a referral form call Paul or Jenny Foltz at 540-896-8505 or email jennyfoltz@breakingfreesaddledoctor.com. 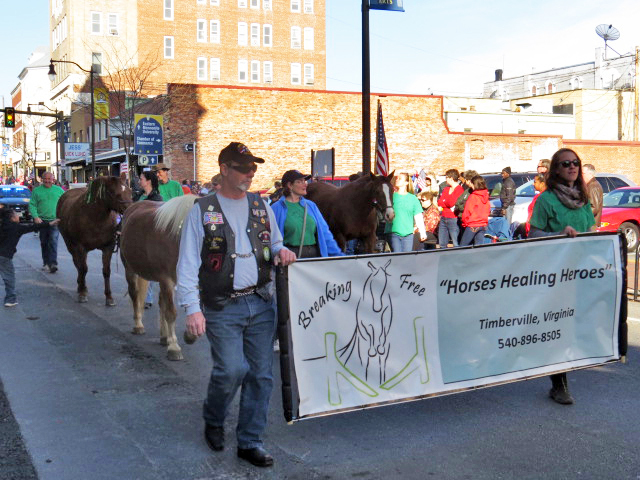 Breaking Free was proud to join the Veterans Day parade in Harrisonburg, VA.